It's no secret how glass improves the look and feel of a home--allowing for more natural light to enter and help space feel larger. However, the effect of glass is even more pronounced when a home uses folding glass walls. These add another dimension to the architecture by improving the flow of fresh air and opening the home up to the outdoors. 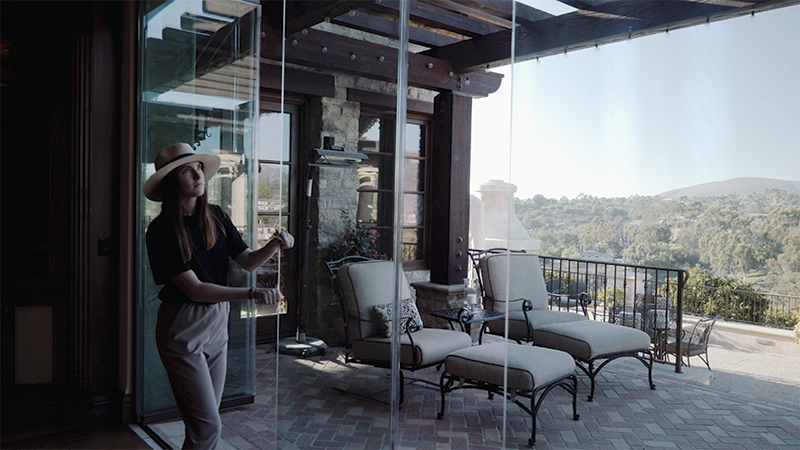 One example of a property using a glass wall system for just those reasons is this beautiful home in Rancho Santa Fe, which elegantly balances indoor outdoor living. When visitors approach the home from the back, the folding glass walls welcome them. It doesn’t matter if the frameless glass is open or closed — it feels inviting. Without the folding glass doors, there would be a massive stone wall instead, which would feel far less friendly and warm. When the panels are partially open (as in the photo), the effect is particularly striking. The lines the frameless glass creates harmony between the other elements of the design, including the steps, railings, beams, and columns. The sliding glass door system is more than aesthetically pleasing but also useful — it connects the interior to an outdoor living room. The panels stack on top of each other and fold to the side to create a large opening. Better yet, the recessed lower tracks mean that it’s easy to move from one area to another, as there’s nothing to step over. Although a large amount of the wall is now glass, the homeowners have no security concerns. Cover Glass systems are far safer than traditional sliding doors. Not only is the glass around five times stronger (making it near impossible to break), the panels cannot be pushed from their tracks. Furthermore, the door features a safe but highly-effective locking system on the inside. Only by looking through the sliding doors from the inside can you appreciate how much they bring to the home. Without the large, clear glass, the homeowners would be missing out on fantastic views of rolling green hills right from their living room. To make the most of the homeowner's view, the glass takes up almost the entire wall. It is also frameless, using the beams from the porch to frame the scene instead. This photo also shows how big of an impact the folding door system has on natural light entering the home. With a flexible system like Cover Glass, it is easy to make swing doors match any style of home. In this case, the glass doors are unimposing yet impressive and take nothing away from other architectural features. They fit seamlessly with the steps and deck, making it hard to imagine the home without the glass system. Folding glass walls are excellent for transforming more than just this one house. Any home with a deck, balcony, or great views will benefit from the opportunity to gain flexibility, added comfort, and improved aesthetics that opening glass walls bring. Are you ready to transform fixed walls into something absolutely stunning?